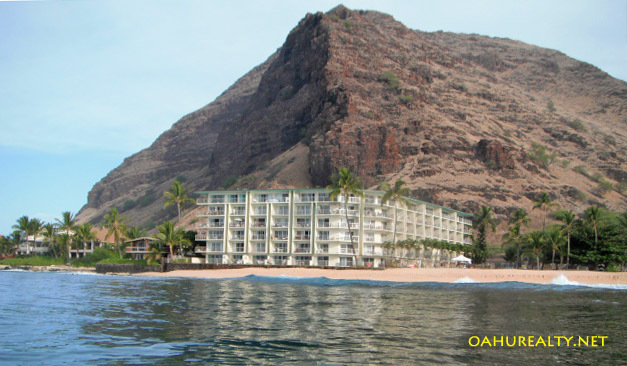 Located along Farrington Highway, next to Makaha Beach is the Makaha Shores condominium. This is a true oceanfront property. This building was constructed in 1967. Makaha Shores has six floors with a total of 67 condos. Amenities include an elevator, swimming pool, community laundry, trash chute and guest parking. Makaha Shores has two floor plans. Studios have approximately 323 square feet interior area plus lanais 82 square feet and one-bedroom units with 420 square feet interior plus 100 square foot lanais. This property is zoned residential, however some Makaha Shore units are permitted for short term vacation rentals. The short term rental designated units do command higher prices. The City and County allows current permits to continue as long as the owners meet certain requirements. New vacation rental permits are not issued.